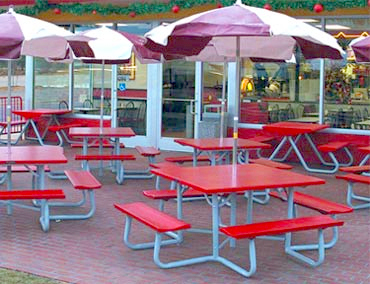 Incredibly strong yet lightweight, these low to no maintenance 48" square tables are ideal for just about any location. The contoured seats provide excellent comfort add the optional backrest for the ultimate in comfortable seating. They can take the abuse that can be dished out from high volume use and the harshest of weather conditions. The frame is constructed of 1-5/8" aluminum tubing finished in a powder-coated light utility gray. Seat, table top and backrest are available in the colors as shown. Models are come with or without umbrella holes.